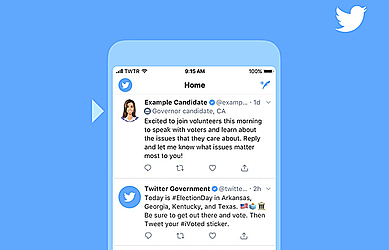 NEW YORK (AP) — Twitter says it's adding special labels to tweets from some U.S. political candidates ahead of this year's midterm elections. Twitter says the move is to provide users with "authentic information" and prevent spoofed and fake accounts from fooling users. The labels will include what office a person is running for and where. Both the candidate's account and the tweets from it will get labels. The labels will appear on retweets as well as tweets off of Twitter, such as when they are embedded in a news story. Twitter, along with Facebook and other social media companies, has been under heavy scrutiny for allowing their platforms to be misused by malicious actors trying to influence elections around the world. The labels will start to appear next week for candidates for governor and Congress. Twitter wouldn't say whether it will extend this outside the U.S., where elections interference has also been a big issue. The San Francisco-based company is working with the nonprofit, nonpartisan Ballotpedia to help identify the relevant Twitter accounts. Beyond labelling accounts, Twitter and other companies have previously said they would label political ads as such and provide information on who paid for them. Facebook said in March that it is making progress in addressing election abuse ahead of the U.S. midterms. Its efforts include expanding its fact-checking efforts and using artificial intelligence to block malicious accounts before they can spread misinformation.